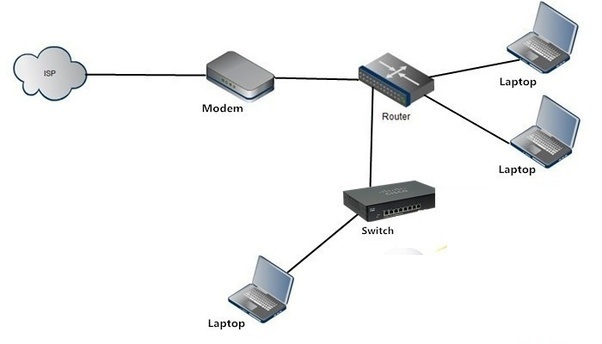 Distinguish, differentiate, compare and explain what is the difference Between Modem and Router Device. Comparison and Differences. Your modem acts as the bridge between your LAN (local area network) and the Internet. You plug your DSL modem into a telephone jack (once you subscribe to DSL service) and you get a standard Ethernet cable output that you can plug into any router (or single computer) to connect to the internet. Your router, on the other hand, creates a network between the computers and other Internet-connected devices in your home. It sits between your Internet connection and your LAN. It lets you connect multiple devices to the internet through one physical internet connection and lets those devices communicate with one another over the LAN. Your router also offers some protection to your devices from being directly exposed to the internet. 1 A Modem can only connect to one device. It can either be connected to a PC or a Router. While a Router can connect to multiple devices. Either through a wired connection using Ethernet cables or through a WiFi network. 2 Works for Data link layer (Layer 2). Works for Network Layer (Layer 3 devices). 3 Passes the data as it receives from the internet without screening the data. However, in most cases router, is equipped with firewalls to screen the data and examine data packets. 4 The modem uses inter-networking devices. Whereas the router uses networking devices. 5 Has no security measures. In contrast, the router provides security measures to protect the network. 6 A modem facilitates a connection to the internet by transmitting and receiving data over telephone lines. The router directs data in a network. In addition, it passes data between home computers, between computers and the modem. A Modem has 2 ports, one port connects to the Internet Service Provider. The other one connects either to a computer or a Modem. Consequently, a Modem can work without a Router providing internet connection to a Single PC. Lastly, Routers cannot connect to the internet without being connected to a Modem. Routers come with 2, 4 and 8 ports for enabling wired connection to multiple devices in addition to the wireless WiFi connection. Both of the devices use packet as a data transmission form.